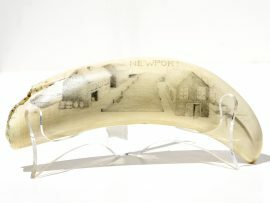 “Set Sail” black and white scrimshaw on ancient walrus tusk ivory by Steve Willeford. Dramatic rendition of crewmen setting a sail in heavy weather. Really like the way the deck is tilted, giving the impression of things to come. Note the expression of the sailor at the top. One of the best traditional black and white scrimshanders still working today, Willeford’s work is prized for its attention to detail and straight line work. 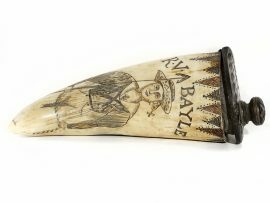 Steve has worked with Scrimshaw Collector for decades and seems to get better and better, although he does not create as much work as he did several decades ago. Who does? This is mounted on a striking stand of bubinga, ancient mammoth ivory and abalone. Excellent value for such quality.